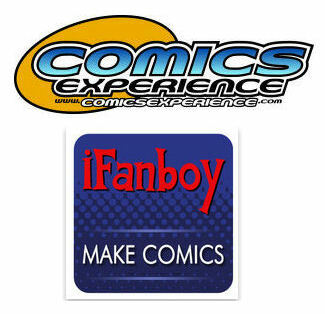 Last month, Comics Experience in association with iFanboy, held a free "public" online Workshop on BREAKING IN. 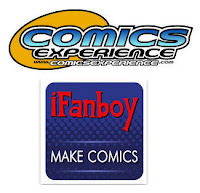 Listeners of the iFanboy MAKE COMICS podcast had been invited to attend and had the opportunity to discuss the industry and craft with former Marvel and IDW editor (and CE founder) Andy Schmidt and iFanboy host and comics creator Josh Flanagan. We had a great FREE WORKSHOP the other night, and we had so many questions, we couldn't hope to answer them all during the one hour long session. So, we took down the remaining questions, and I started answering them here. This just scratches the surface of the kind of information, inspiration, and activity that the Comics Experience Creators Workshop is all about. The Workshop has monthly challenges for writers and artists, script critiques from professional comics writers, artists, and editors. It's got live workshop sessions with creators to talk about their careers, their work habits, and their books. Imagine talking directly with Scott Snyder about American Vampire or with Rob Guillory and John Layman about Chew. Heck, we even talked to Robert Kirkman about The Walking Dead before it was a hit TV show! The point being that we're a group not only focused on improving our craft (be that writing or illustrating or coloring or even lettering or editing comics), but we also want a greater understanding of the creative process and the comics industry overall, while still having a lot of fun. Below you'll get the answers to everything that we didn't cover during the live session except for a few questions selected to answer on the iFanboy MAKE COMICS podcast in future episodes. Those we'll answer on air! Hope you find the answers of use! Before I dive in on these, I did think it worth mentioning that many of the questions that follow are difficult to give complete answers to since I don't know the full story behind them, nor do I know what the goals of each individual are. For that reason, some of the answers may seem a little repetitive. Hopefully, as I get to know people, I'll be able to give more detailed answers in the future to them -- and to you -- should you decide to join the Creators Workshop! Okay, now to the answers! As an indie creator, how soon should one incorporate oneself? What kind of benefits are a result of incorporating? That's a tough question, and I'm not accustomed to giving any kind of business advice. But, what I can tell you is that when I went out on my own, I formed a company immediately. As a creator, it provided some level of legal protection to me as an individual and it also made it very clear what the company owned versus what I, as an individual owned. For example, everything that I created was owned by the company, not by me. That way, should a lawsuit occur for any reason, the lawsuit would be levied at the company, rather than me as an individual. So, for those reason, I made a company and I consulted with a business advisor and an accountant. Let me state clearly that I am not advising that that is what you should do, but that is what I did, and five years later, it's worked out well for me so far. If you're thinking of making this kind of a decision, I'd recommend you gather as much information as you can. There are different kinds of companies that you can form and they have different benefits and different drawbacks, so you have to choose which (if any) are right for you and your needs. As writers, when you begin a brand new project, what are your methods to get started? Do you plan the story outline etc. ahead or do you put metaphorical pen to paper and just get writing? It really depends on the project, Jack. When writing, I like to switch my process up to see what I can discover. I've only done one project where I had a one-page, very loose outline and then just started writing from the beginning. That was a four-issue series and it had the desired effect I wanted for the project, keeping it loose, fast-paced, and light-hearted. But I've only done that on the one project. What I teach in the Introduction to Comic Book Writing class is a methodology of breaking down a story and building it back up in an explicitly comic book format. Comics are different from other media, so the process I teach helps each individual get to the core of his or her story, and then build it to fit the medium. It's not a "paint by numbers" process. There are no rules and I always encourage experimentation, but it's a helpful framework for building up a story from just a simple idea. This process is unique to Comics Experience courses and it is the life-blood of what Comics Experience does, as no other comics educator does this. What about old contacts or reestablishing old contacts? I have in the past been in contact with editors at Dark Horse, Oni and Antarctic Press, but I wasn't making comics for nearly 5 years while I was away at school. How do I reestablish those possibly broken relationships? Any advice? Sure. It reads to me like you've got a perfectly legitimate reason for being out of touch, Solomon. You were in school. I'm not sure what for, but it probably doesn't matter. I think reaching out to those people over email (or phone or whatever, depending on what level each relationship was on) and simply stating that probably does the trick. Just be up front about the fact that you've been out of touch, but that you're focusing your efforts back on comics now, and then start up the conversation. Honestly, not really. I know comics creators with agents who help pitch their projects in Hollywood and try to sell their properties in Hollywood, but I don't know of a service like that for comics. If it's out there, I've not seen it. What I have seen are studios for artists (and some of them have a writer or two) that go around to comics publishers and try to get work for the artists in their studio. I have the majority of the artwork done (text to come) of the first issue of my series. What is the best way to find an indie publisher? It may sound overly simple, but simply contact any publisher that you think might be interested. I'd look at the catalog of titles that the publisher has put out and see if you think your project might fit in that library. And then I'd suggest sending an email of inquiry. Always look on the publisher's website to see if there are submission guidelines and use that as a barometer. As for actually finding an indie publisher, you've got to search the web and go to comic shops and start reading. There's no way to avoid doing some legwork to figure out where you think your book will fit into the published world. When pitching, is it better to pitch a couple page story, or something bigger, like a full issue or couple issue storyline? Completely depends on the publisher and subject matter, Scott. But starting out, as a general rule, I'd stick to the shorter stuff. It requires a much smaller commitment (and financial obligation) from the publisher, which makes saying yes easier -- assuming they have an anthology or are open to one-shots. If you're doing a creator-owned series, than you might want it to be long enough to create a collected edition trade paperback. Those tend to be four standard issues in length or longer -- sometimes three, but that's more rare. What are the pros and cons of giving away free books to people at conventions, comic shops, etc.? At conventions, it's two cons: 1) there's a significant cost associated with going to a convention, printing the books, and handing them out. That's an expensive way to get the word out about your book. And 2) often, when people get something for free, they won't give it a read because they perceive it as having no value. I don't agree with it, but it's true. And so you may have handed out a bunch of copies of something, but the actual number that get read may be very small. The positives are that you're getting the project out there and seen and you're able to talk with people and make those personal connections. It's extremely difficult to put any kind of a price tag on that. As for handing them out at a shop, I'd make sure you speak to the owner first! As we've discovered, I have a unique last name that isn't easy to pronounce. Any thoughts on using a pseudonym? You can if you want, but I don't think it's that big of a deal. Typically, the work is what people are interested in, not the name on it -- until your name is so associated with awesomeness that it has a positive influence attached to it. I think you'd be fine using your own last name. If you just don't want to deal with it, then you could use another name. But I'd make that decision early so you don't start to build with one name and then switch over to another. I think I even mentioned this during our conversation that I went by another first name when I was an intern at Marvel and then went by a different first name when I was hired. And that was just a hassle. I wish I hadn't tried using my first name for that summer -- but who knew that would turn into a career? Ha ha. Regarding self-publishing for one's own enjoyment (basically having a printed, finished book), what options are available at different financial points? There are a lot of different options. There are print-on-demand options like Ka-Blam, or there's contacting printers directly and getting pricing from them -- there are hundreds of printers both in the United States and outside of it. And there's printing your book at a place like Kinkos for low print runs. The basic equation is this: the lower the print run, the higher the price per unit. In other words, if you're going to print 100 copies of something, you might pay $2.00 per copy for a total of $200 (I'm making these numbers up to illustrate the point, there are a lot of factors that determine the price of printing) but if you printed say 10,000 copies of the book, you may only pay 50 cents per book, but the total would be $5,000. It all depends on what you want to do with the books and what your personal financial situation is, but I will tell you that different printers will price things very differently. Never having been published before, if you have a graphic novel length story concept, is it better to create a series of smaller books or go for the whole novel? With so many of these questions, Jason, I'm sorry to say it all depends on your goals and your financial situation. I'm assuming you want someone else to publish this, in which case, this is more a question for whomever that publisher might be. In general, the reason to do things in chapters first is to earn a little more money if orders are high enough that you turn a profit on the individual issues and to help with cash flow so that while you're continuing to spend money to produce the end of the project (or other projects that publisher might be funding) there is some cash coming in. Contracts. One of the major sticking points at the beginning of my project was the contract. Any suggestions on making the work made for hire a smoother process? Usually, the key is being upfront with your partner that your intent is to own everything. Typically, this means you're going to have much larger up front costs because you're paying an hourly (essentially) page rate. And your contract language needs to be crystal clear on this point. As for smoothness, some people just flat out don't want to do work made for hire work. And it's hard to argue with that. If you run into that, I'd suggest either changing the deal so your partner is comfortable with it, or finding a different partner. The real key on any of these deals and collaborations is to reach an AGREEMENT. That means you and the partner are both getting something of agreed upon value out of it. No one feels like he or she is being taken advantage of. Remember, you're dealing with people and people work harder, better, and longer if the person they are dealing with treats them with total respect and with dignity. Sounds sappy, but it's so true. The intern culture does not really exist in Ireland. How important is that avenue to breaking in? It's not essential. Ultimately, the work and persistence proves you out. There are a lot of interns who go nowhere in comics. Some don't really want to, but some wait around for someone to call them and don't have the drive. It's a helpful tool if you have the drive and work ethic to keep going. In my own story, I was an intern for a summer and it was FIVE YEARS LATER that I got my first job -- and it wasn't for lack of trying. The internship helped, but it wasn't a deal breaker by any stretch. In the end, it was a connection I made while I was an intern that led to me taking a trip to NYC, but it was my own work that got me the interviews I had while I was there. That same trip, not having interned at DC Comics, I was able to get interviews with five people there by making contacts while living on the other side of the country. I am working on some pencils from a sample script from an editor. Once I've sent my artwork to this editor, if I don't get work, how often can I hit him up with more art without being considered a pest? Is it bad form to send these samples to other editors at this same company as blind submissions or redirected to my DA page? Two questions here, Matt. Follow up with him or her maybe once a month at most. If you've got really good new work to show, then follow up with newer, better pages. That's the way to build a relationship with an editor (even if you don't hear back). Again, that's about persistence and a professional attitude. The second part of your question is about bad form. It's absolutely OKAY to send the same samples to other people at that company and at other companies. You can't be expected to tailor every sample page to a particular editor. If an editor asks you for specific samples as a try-out for a book, that's a little different. But it sounds like your question is about a script that the editor probably hands out to a lot of artists, in which case, you should be fine sending those pages around. The best way to check on that is if the issue that the script you're given is from has already been published. If it has, you should be good to go. If there's any question in your mind, just ask the editor who gave you the script if it's okay to show those pages around. Do each of you have a particular, maybe less heralded, work that you would recommend as an example of good, solid storytelling? My own (this week) would be Daytripper. I can't answer for Josh, but for me, I've become fairly enamored lately with The Sixth Gun. It may not be perfect, but it does a lot of things right. I really enjoy reading that book. For solid storytelling from an artist standpoint, you can't do any better than something illustrated by John Romita Jr. If you prefer non-super-hero fare, you might want to try something like Moving Pictures by Kathryn and Stuart Immonen, which is just a beautiful little book with a lot of nuance. Would publishers be reluctant to publish a story if the creator(s) kind of young? If you're a minor, that might be an issue due to state or federal laws. I don't recall ever running into that as a concern. But even so, there's probably a way to get that cleared. Other than that, I can't think of any issue that would arise. Create something awesome, Wesley, and let me know what they say! Just read your book 5 Days to Die last night. Curious how you approached the scripting. Do you outline first and fill in dialogue later? Do you write and then massage the beats to issue breaks? Or maybe like Stephen King who claims to just sit down and write without thought for structure? First, thanks for reading the book. I hope you liked it. I approach my scripts differently each time. That said, I always do a variation on the process that I teach in the writing class. I just try to do one or maybe two things differently to keep it fresh and experiment. I'm not so confident that I can do the King approach -- ha ha. But I developed the working process that I teach from my own writing and editing work and it's designed to help writers hone their story, really understand it, and then build up around it -- and to do so in smaller, bite-sized pieces so it becomes much more manageable than it feels looking at that blinking curser on the blank computer document. I've received a lot of positive portfolio attention from editors at conventions. I follow up routinely, but rarely get a response. Do you find that editors pay attention to follow-ups from artists, even if they don't necessarily respond? Going to San Diego Comic Con next month . . . my first time. Any suggestions on shopping the comic there? Strategize before hand. Figure out what publishers -- and editors -- you think might be interested and make a plan to see them all if you can. That's the biggest thing, just getting out there and staying on target. Go to the publishers and try to set up appointments. Not all of them will allow that and be prepared that even if you get one, the person may not be there on time, so get there early and be flexible. You might have to try three or four times before you get to talk to someone who can help. Has the "Sam Adams" route of going store to store to sell a comic ever been done? I'm honestly not sure, Edward. I think so. I do know that many creators work out deals with local shops to sell their books on a consignment basis. But that's a little different. What do you think about pitching to editors, not publishers? I'm not sure there's a difference. If the editor is working for a publisher, then you are essentially pitching the publisher because he or she is acting in the interest of his or her employer. If you're talking about hiring your own editor, then I think that's fine, but it doesn't tend to help you get a publishing deal, if that's your end game, unless the editor is good enough to really help you improve the overall book. Does having an agent really help, nowadays? Unless this has changed in the last couple of years, not usually. Comics don't tend to pay enough to really be worth an agent's time and probably because of that, they tend to try and squeeze every last dime out of a publisher and over value the work in the process. I've seen more agents kill deals outright than help make them happen. But, this is another question about what you're comfortable with. If you want an agent, just try to find one that you really trust, especially if you're trying to work in other aspects of the Entertainment Industry as well. I have known some creators who carve out comics work from the deal with their agents for exactly the reasons I stated above. Again, all personal taste and comfort level though. Are there any well-known scams out there that take advantage of new writers or new artists? Well-known? I don't think so. But every once in a while I do hear of scams, so please be cautious if you're about to give someone your money. Be as diligent as possible. Where can you find examples of plots, outlines & scripts? There are online resources where you can get scripts. Or you can often contact publishers or creators directly and they'll send you a couple. What I like about getting them from publishers, is they often have scripts that are of high enough quality that as an artist, you won't have to be fixing a lot of problems that the writer creates -- they're vetted to some extent. Any ideas on marketing digital comics at a convention? I'm having a hard time convincing people to buy virtual merchandise later online who want to buy physical merchandise now. That's a tough one. I think you've hit the nail on the head though. The only way I can think of is to give them a deal if they download it right there on the spot, but that also assumes that people can download it right there on the spot. You may be better off just promoting the project with printed material that you can hand out, and trying to capitalize on that later. That is a tough issue, and not knowing any more particulars, I don't have an easy answer. Should there be two contracts when it comes to payment and percentage of creation ownership? I'm not sure why there would be two contracts. There can only be one contract between you and the other collaborators. After that, there could be a second contract with a publisher who agrees to publish the material, but it would have to be in line with the original contract between the collaborators. For example, if you and a collaborator agree to split everything 50/50 in a contract, but the deal with the publisher that you make, gives the copyright owners (you and your partner) 40% of the profits (numbers just made up here for the illustration), then that means that you'll get 20% of the profits and your partner will get the other 20% because you've already got a contract between the two of you. Not at all. That shorthand is useful from time to time, but it's by no means necessary. You'll also find that a lot of people are annoyed by that particular trick. The reason being that it gives very little information. Using your own example: is it the tone of The Matrix? The action style? The themes? And is it the setting of Fantasy Island? Characters like those in Fantasy Island? There is no clear idea of what you're pitching. So I'd be conservative on when you choose to use them. Headed to HeroesCon in about a week. What day should I approach other creators with my sample artwork, and do you have any etiquette tips? Oh, man, sorry Kinch. I just couldn't get these all done in time for Heroes Con. Any and all days are fine to talk with creators. They're all there for the same reasons -- discuss business, network, and meet fans. So you're in the right zone. As for etiquette tips, there are a few. If someone is busy, try and wait until they have a little space. Be polite, professional, and speak clearly. If you're at an artist's table, stand to the side so that someone else can still engage him or her and possibly buy something. You don't want to get in their way. Perhaps ask about talking with them at a different time, if they seem distracted. A lot of this is just feeling out the situation. But the main thing is to relax and approach it like you would a business deal. Doesn't mean you can't have fun and be funny, but don't go crazy with that stuff. Is it better to pitch a story for a popular, A-List character or a B or C lister that hasn't been used in a while? For example, pitching a Spider-Man story vs. a Sleepwalker one? Billy, this is one of those moving targets. It depends on a lot of factors and they are hard to predict. While working at different publishers I'd be more interested in one over the other for various business or creative reasons. Ultimately, if you've got a killer Spider-Man story and that's your best foot forward, do that. If you've got a mind-blowing awesome Sleepwalker story, write that one. The goal is to tell a great story. Personally, I always found the pitches with the B and C listers more interesting to review. But that was just my personal taste. I liked to see someone try to tap potential that I may or may not have seen in a character. That was always cool to me. How do you guys feel about the possibility of creators pitching digital first/only stories and series? I noticed major companies doing more digital exclusive work. Do you think pitching to a company a digital only book/series is still too early? I think it's more a business question than one you'd necessarily have to or want to address when pitching a story. I'd say the exception to that is if the story being on a digital medium is integral to how the story is conveyed. In other words, the story won't work in print or won't work as well. But if you've just got a cool idea for a story, and it doesn't matter if it's digital or print, then I'd let the publisher make that call. They'll have reasons that you may not be aware of for being interested in one or the other. What is your advice for someone trying to break in as an artist, but has a non-mainstream style? In the lines of Ashley Wood, Templesmith, or McKean. How can you make the non-mainstream style work in your favor? I'd say the fact that your style isn't like all the other people you are competing with is a good thing. You may not be the first choice for Batman, but who knows -- you might be just what they're looking for. I'd love to see Ben Templesmith do a Batman story! The fact that you're different is something to celebrate, not worry about it. If your artwork is cool -- and if it brings to mind those three guys, I'm pretty sure it is -- then that should speak for itself. What I would say is this, even if your style is different, you still need to understand how comics work -- how to tell a sequential story in static images. You still need to be a storyteller, even if your art does look different than Jim Lee's. If it's so difficult to break into any form of entertainment, why isn't it all amazing? How does bad work get out there over great work? That's a tough question, Michael. There are probably a hundred different answers to this that are honest. I think it comes down to commerce. There's a demand for stories and there aren't enough awesome creators to generate all the material people are willing to pay for. There are tons of other reasons -- some projects just don't come together the way they were intended. Sometimes a schedule gets moved around, or creators just lose steam -- or an editor can edit a project to death. And then there's taste -- just because you may not like something doesn't mean it's necessarily bad. Lots of reasons for it...but the takeaway here is that there is room for improvement on those shelves. And that should give aspiring creators a lot of hope! If a con is a bad place to pitch, where's a good place to pitch? Email? Twitter? The bar nearest the office? A con is a great place to make contacts. Email is probably the best way to follow up on those contacts. But you can make contacts via email too. But yes, probably on email with most people. But remember to ask permission to make a submission. Is it better in your opinion to pitch an original graphic novel / miniseries over a long form series? Is it easier, do you think, to get a foot in the door at say a place like image? Even though those kinds of publishers do a lot of long form near non-finite stories? Yes, there are just so few places willing to even consider taking a risk on something longer than a graphic novel, that just from a pure odds standpoint, you're better having something self-contained and shorter. That could change in the future though if the business changes. I'm both a writer and artist. I believe I'm a better writer, but have heard it's easier to 'break in' as an artist. Right now I'm thinking of doing a webcomic to feature both. Would you suggest I only concentrate on one, or is it wise to continue doing both? Ryan, it's all about what you want to do. No one in his right mind tries to get into comics to become rich, this is an industry for passionate people (a comfortable living is achievable!). For this reason, I recommend you do what you're passionate about and make a splash doing exactly what you want to do! If you want to do both, do both! There are plenty of working writer/artists out there. If you can do both -- do both! Doing one will probably help you improve the other, on top of that. Some great writers started as artists and great artists have tried their hand at writing only to become better artists! So if my book is done and I have done it all myself and now I want to get it out into the world and I haven't even mentioned it to anyone... what is step 1? Step one is reaching out to potential publishers and editors. One thing you might want to do is get someone to read it and check it over for possible improvements before you start trying to sell it in. Often, the creator can get so close to the work that it becomes difficult to see things such as minor as spelling mistakes and as major as forgetting to name your main character. I've seen all manners of mistakes made by creators who haven't had someone else take a look and just read the book. It's important to get another professional set of eyes on it. After that, it's reaching out to publishers if you want someone else to publish it or reaching out to printers If you want to publish it yourself. I'll throw this out though, there may be a "step 0" that you want to consider. Do an actual analysis of the marketplace out there. Is there a target for the book that you think you can actually reach? I'd hate to see you not do this early work, publish the book, and lose money on it. Printing a book has a lot of costs associated with it, so having a good plan in place to have reasonable confidence that you won't just sink more money into it is a great idea! When writing your first comic scripts, is it more beneficial to write original or to practice with known characters? This really depends on your individual goals, Edward. If you want to write for "The Big Two", then feel free to practice a character that you love writing. In my Introduction to Comic Book Writing class, I recommend against that, because the script is going to be reviewed by people familiar with the character and that leads to problems you won't have creating your own characters. Also, as a general rule, I think you learn more, early on in your writing, creating your own work because you have to do all the building of the characters, the setting, the themes, the plots, etc. If you decide to write a Spider-Man story, for example, his supporting cast, his city, his powers, character themes, and even his personality and voice are all already set up for you. The hard part here is making it all seem natural. Where with your own work, you have to learn how to build all those things from the ground up -- no easy task!